For a new project I am working on (more to be announced) I was looking for a standalone websocket connection manager. Because still many public and private XMPP servers offer only the TCP transport or BOSH. After WebSocket support came to DotNetty which one of the latest releases, and MatriX vNext of course having full support for XMPP XML streams and clients I was considering creating my own proxy. So it took only a 90 minute flight to come up with a working solution. I would not consider this solution as production ready yet. But the current design using DotNetty and MatriX vNext can support this at high scale. We are thrilled to announce the next generation of the MatriX XMPP libraries. 15 years elapsed already since we started our first .NET/c# XMPP library agsXMPP with .NET 1.0. Our XMPP libraries and the .NET technologies had many major evolutions over the years. With the switch to .Net Core we also took the opportunity for a major rewrite and redesign of the codebase. The API for clients, servers and components is not backwards compatible, but all XMPP protocol classes remain the same. Updating existing code bases to MatriX vNext should be pretty straightforward. 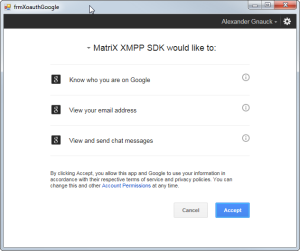 We get a lot of requests on howto use the MatriX XMPP SDK with Google Firebase Cloud Messaging. Firebase does not support XMPP’s StartTls feature and requires to initiate a TLS connection. This is how we have done it in the old days when the protocol still was called Jabber. The OldStyleSsl property takes care of this in MatriX’s XmppClient. 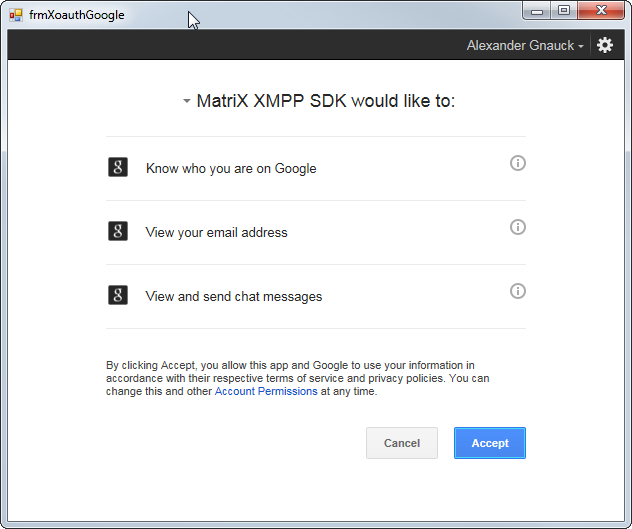 The MatriX XMPP SDK is also available for the .NET Core now. It passed all our internal tests and QA, but its still marked as a pre-release until we collected some more feedback from users. Don’t hesitate to contact us directly, or use our forums for any questions related to the .NET Core version. All our customers with active support & maintenance can of course upgrade to MatriX 2 for free. Updating existing code bases to MatriX 2 should only take a few minutes. We highly suggest the update because there are many improvements in the MatriX 2 core, and also many new features on our roadmap. Currently BOSH and websockets are supported as transport layers. Node.js and tcp sockets are coming later. MatriX JS will be licensed under a Creative Commons Attribution-NonCommercial 4.0 International (CC BY-NC 4.0) license. The first version of MatriX was released in February 2009. Now 6 years later we announce MatriX v2 pre release. Over the last six years we released all new features and improvements always immediately to our customers, without making major changes in the version number. There have never been any breaking changes. MatriX v2 has many major improvements in the core, but we also have done some minor changes in the Api. Most of the Api changes are related to Enum names only. Many of them were never compatible with the c# naming conventions. They have been there because some of the supported .NET platforms were not able to parse the values case-insensitive, and there were no other ways to do this without using endless IF or SWITCH statements on all platforms. Also some of the code is still left from the very first .NET version of our XMPP components in 2002, using .NET 1.0 and C# 1.0. In the very early days of c# many people were using Java, C or C++ conventions for the new c# language. Updating even huge codebases to v2.0 should be very easy and take only some minutes. With 2.0 we will also separate the NuGet packages by platform. This will allow us publishing NuGet packages much easier and more often. There is still lots of platform specific code in each MatriX edition which does not allow us to work on all of them in parallel. Right now only builds for teh Full .NET Framework 3.5, 4.0 and 4.5 are available. All other platforms will be published in the next days. Of course all MatriX licenses keys with Support&Maintenance are valid for v2 as well. When you find any issues with the pre release please report them directly by Email to us, or use our forums. In July 2014 Google has introduced the “More Secure Gmail Authentication feature”. When Access for less secure apps is set to disabled then Google does not allow login over SASL PLAIN anymore (even on TLS). During authentication Google replies with the not-authorized error. And they will notify you by email that access to an insecure application was denied. When access for less secure apps is disabled you have to login with the X-OAUTH2 SASL mechanism the Gmail XMPP server offers. Here is a small tutorial how to achieve this with MatriX. In order to access the Google API you have to setup a project in the Google API Console which provides you the Access credentials. Once you have created your API project you can request your credentials which include the Client Id and Client Secret. During the creation process of the app project we selected “native application”. There are also several .NET libraries available, e.g DotNetOpenAuth or Google APIs Client Library. We are not going to use a third party library for now, because this help us also to understand the whole XAuth authentication flow. When the user now clicks on “Accept” in the authentication dialog the page in the browser reloads. The new page contains an Authentication code in the title tag. The authentication code is also in the body of the result page. We have seen cases where the code in the title tag was cut off. So it could be more secure to parse it from the body. // when there is "success code=" in the title its the page we are looking for. // user denied the app dialog, handle this here. Now we have the Authentication code, and can use it to request the access token and refresh token over a simple HTTP Post. The result is in JSON, we use Newtonsoft.Json to process it. This request returns JSON payload where you could fine the users email address. Now we have everything to perform the XOAUTH2 authentication with MatriX. We need to subscribe to the OnBeforeSasl event to manual select the SASL mechanism and pass our access token. Can I use MatriX with Unity 3d? Of course you can. Many of our customers are using it with great success in their Unity projects. Unity is based on Mono. MatriX is designed for cross platform and works on all major .NET platforms, including Mono. Many Unity developers have some problems to get started with MatriX on Unity. This post should be a small tutorial and address some of the issues you may be facing during your Unity development. 1) Download the correct MatriX dll (Mono build). MatriX builds are not universal, which means you need to download and reference the MatriX library for Mono. 2) MatriX requires System.Xml.Linq.dll. Make sure that you reference System.Xml.Linq in your project as well and add it to your assets. Otherwise Unity may throw an exception when you run your project. 3) Depending on your Unity version you may get compiler errors on iOS. When you use the latest Unity version this should be no problem. On older Unity versions this problem is related to obfuscation. To resolve this please contact us directly. 4) The iOS stripping feature causes problems. It does not work when reflection gets used. The core Xml serializing engine in MatriX is build on reflection using a factory pattern. You either have to remove stripping from your complete project, or exclude the MatriX classes. It looks like disabling all stripping in Unity is not enough and the link.xml file above must exist. 5) Some of our users reported that connecting to an XMPP server does not work inside the Unity editor because of some networking problems of the IDE. When the code gets executed or published on a device it works fine. This is a restriction of Unity and not related to MatriX. If you run into any other problems please contact us directly. We do our best to solve them.